MFI Peruvian Maximization is a superstar of Accoyo and Alianza descent. 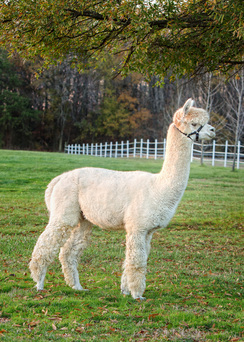 He exudes presence and style with his flawless conformation, gorgeous head and outstanding, true-to-alpaca phenotype. All topped off with a highly advanced, super soft fleece, extremely well defined crimp and excellent density. 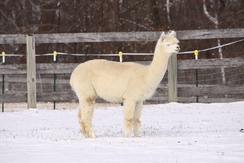 Peaches ‘n Cream is an exquisite full Peruvian female out of Shades of Gray. She presents an ideal combination of conformation and dense fiber from her toes to her topknot. Blend this with her superb crimp and handle and you may wonder how this package could be improved. Proven Champion Producer! Peaches is a very attentive mom and an excellent foundation female. 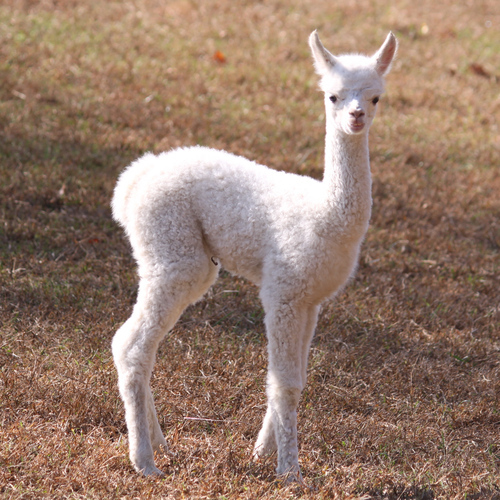 Morning Star, aka Nova, is a beautiful bright white female with lustrous soft fiber. She is very inquisitive and loves to play with her best bud Dusty.